Hello Peter, i send to you, the second Mark on the second Vase. You will see it's not the same and a small piece is missing on the mark. You told me they dont go together but when you look the design of the pattern, it looks to be the same. Of course some details are different but very few. Also if needed i can send you more photos, because we find a lot sign of age like the bottom, small cracks on the color. The two characters that can be read are the same as those of the other one. The triangular mark changes things a bit, though. 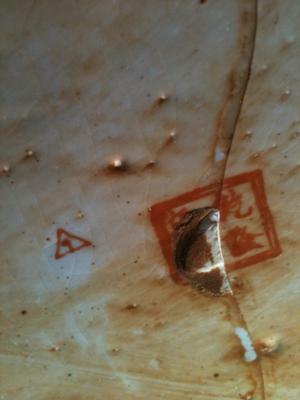 I am yet to see the use of a triangular mark in Chinese porcelain. This reinforces the possibility that it is not Chinese, unless this is a part of faking the origin.